Was it prescience or good luck that led me to book a ticket to The Humans only minutes before the New York Times review went live? Probably both. 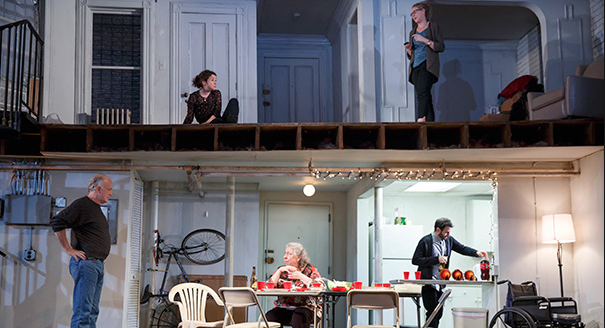 I had admired playwright Stephen Karam’s earlier work, and the buzz I’d heard about The Humans was strong. But the timing was mostly coincidence. It turned out to be a good thing. That Times review was the kind writers dream of (“blisteringly funny, bruisingly sad and altogether wonderful,” wrote Charles Isherwood) – and other critics joined in (Jesse Green in Vulture praised Karam’s “thrilling mastery of polyphonic dialogue”). Five days later, when I saw The Humans, the show was sold out, there was a line for cancellations, and the sense of big expectations was palpable. That’s a lot of pressure for a small play (six characters, 90 minutes set in real time), and even before it started I mildly regretted having read those reviews. For the first 15 minutes or so, I had my doubts. Karam’s play is notable for wit and charm – but is there more than that? There is. The Humans sneaks up on you, growing ever more complex. It didn’t immediately knock me out the way Annie Baker’s The Flick and John had, earlier this season. But this show did something perhaps more important – it stayed with me. Throughout a weekend of (very good) theatre-going, it was The Humans I kept thinking about. I mention those two Baker plays because there are similarities. Karam is focused on something rather small and, in a sense, ordinary – a multi-generational Thanksgiving dinner. The style flirts with hyper-realism. Like John in particular, there are aspects of the supernatural (or at least unexplainable happenings of the creaky-house variety). But Karam is after something else, I think. The Humans is a meditation on the underside of an American dream. It’s axiomatic that parents want their children’s lives to be better than their own. But what happens when that wish becomes reality? The Humans is about this and more, including another layer of familial difficulty, involving Erik’s aged, incoherent mother, Momo (Lauren Klein). To all of it, Karam brings rueful humor – also insight, sweetness, compassion. The thorny path of conversation – from superficial cheerfulness to open resentment – is executed with such mastery we barely feel it coming. Yet we’re immersed in its downward gravitational pull. 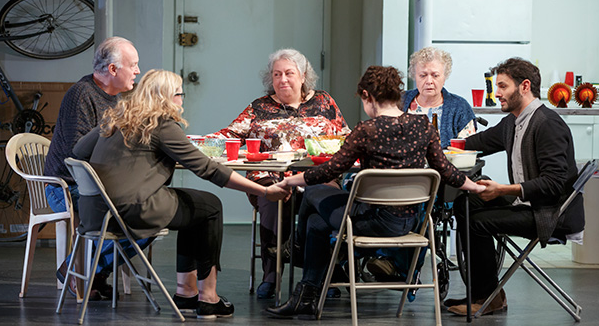 At the Roundabout, director Joe Mantello’s production is, in subtlety and substance, equal to Karam’s script. Mantello has become the go-to director in New York for everything from big musicals (Wicked) to intimate drama (Frankie and Johnny in the Clair de Lune). With those credits and many more, it’s a bold claim for Charles Isherwood to say of The Humans that “this may be his finest work in an already distinguished career”— but I’m not inclined to disagree. The production is far more complicated than it looks, with particular challenges ranging from how to navigate the tiny but crucial shifts in tone, to a bi-level stage with simultaneous action above and below, which must be seamlessly synchronized. 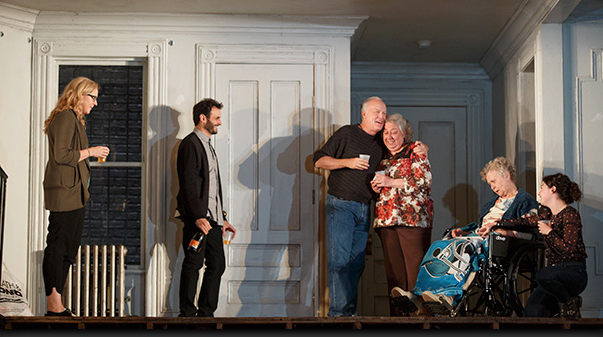 Mantello accomplishes it all without apparent effort – and surely his hand is also imprinted on the fine performances of the entire cast, among whom Reed Birney and especially the wondrous Jayne Houdyshell shine especially bright. And then there’s the creepy, supernatural stuff. I’d been told to expect it, and as The Humans went on, I found myself dreading it. The play is so… well, human, that I really didn’t want it disrupted. In the end, I needn’t have worried. Mantello’s work is as good here as elsewhere – he milks a sense of ominousness without ever going too far. I’m still not entirely convinced that the play benefits from it, but perhaps we need to consider it in light of the play’s title. Things that go bump in the night can be inexplicable and scary – but not more than family dinners!